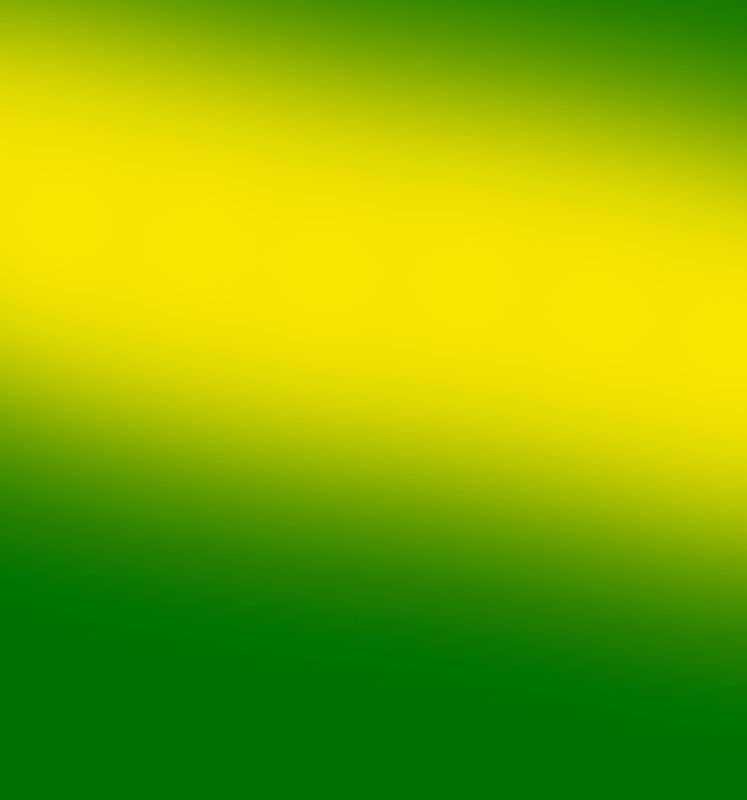 I have created a natural farm and Homestead using Permaculture and Organic Farming methods. 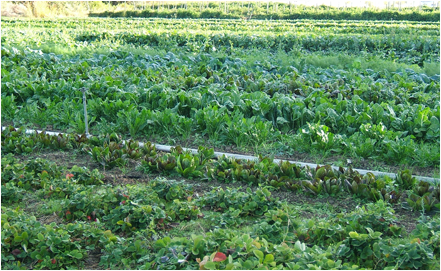 I grow real produce, free of harmful pesticides, chemicals and gmo’s, using environmentally friendly farming methods. 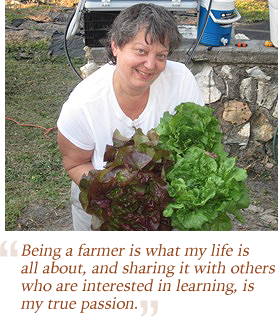 I grow seasonal fruits and vegetables all-year-round in North Florida. You can visit us at the farm most Fridays, or stop by our local farmers market in High Springs on Thursday afternoons from 12 – 4pm, where I bring naturally grown fresh produce, and delicious homemade baked goods. I welcome you to join my CSA to receive assortments of fresh seasonal harvested vegetables, fruits and herbs weekly, bi-weekly or monthly. I bring Farm Fresh Produce to market and sell directly to our community from our farm. I recently created a CSA, to give folks an opportunity to receive a box of fresh harvested produce weekly or bi-weekly, while supporting the farm to sustain itself. I welcome visitors for a tour with a scheduled appointment for a fresh adventure and delicious produce for you and your family. I am committed to Health and Wellness for my community and I grow seasonally year round. From time to time I bring back dilicious Tropical Fruits from my Farmer friends in South Florida, such as Mangos, Star Fruit, Mamey Sapote, Black Sapote and Avocados. At Bambi’s Organic Country Farm, I believe in growing, buying and selling local to strengthen our LOCAL economy, while supporting folks to be healthy. I am honored to share my knowledge and I love what I do here in our beautiful town of Fort White, FL. I am committed to providing my community with the freshest and most delicious produce at fair prices. My passion is to make a difference through educating, sharing knowledge and food tips so we’ll all live happy and healthy lives. Bambi Liss has over 36 years hands-on experience in the natural foods, healthy living and cooking world. She started her healthy life journey in 1981 when she opened Bambi’s Kitchen in South Philadelphia. As a trained macrobiotic chef, Bambi worked as a chef/owner of a personal catering food service for people who wanted a healthier diet and lifestyle. From a little kitchen on 6th Street, Bambi was able to provide macrobiotic healthy meals to busy executives, people living with serious medical conditions and anyone who just wanted healthy tasty meals to keep up their energy and feel great. After 5 years of running a healthy personal catering business, Bambi decided to head to South Florida for a vacation. She fell in love with Florida and decided to stay. In 1995 Bambi worked as a private chef for a high level executive in the Fort Lauderdale area. She was tasked with planning daily menus, preparing all meals and catering large parties at this private residence. In 2005 Bambi worked for Whole Foods Market in Aventura as a Marketing Specialist where she planned all special events at this location. In addition she held special cooking classes, did natural food demonstrations and worked to get the local business community healthier with making better food choices by shopping at Whole Foods Market. In 2009, Bambi began teaching children and adult cooking classes at an after school program in Miami and Hialeah. She concentrated on teaching about locally grown produce using natural condiments and foods in the classes. She created a vegetable garden as part of the curriculum, which was a huge success within the local community and is still active to this day. Bambi then pursued an education in farming and was awarded a special position as a Farmer Apprentice for six months in Homestead, FL. She worked as part of a design team studying permaculture and designing a 20-acre farm through the esteemed Earth Learning organization in Miami. This is when Bambi’s true passion for farming was ignited. After 15 years of living in the hustle bustle of South Florida, Bambi and her husband Ellis decided to make a change for a more healthy and conscious lifestyle. 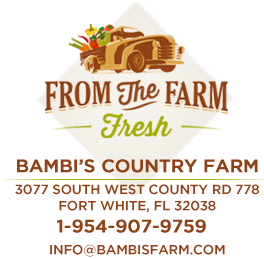 They searched for a property where Bambi could start up a natural farm and work 100% at growing the healthiest, most delicious vegetables and produce. Thus, Bambi’s Country Farm was established in the Fall of 2012. At Bambi’s Country Farm, we believe in growing, buying and selling local to strengthen our economy, while supporting folks to be healthy. We are honored to share our knowledge and we love what we do here in our beautiful town of Fort White, FL. We are committed to providing our community with the freshest and most delicious produce at affordable prices. Our passion is to make a difference through educating, sharing knowledge and food tips so we’ll all live happy and healthier lives.